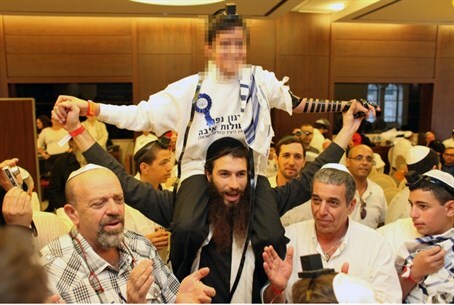 Bar mitzvah for son of Jewish woman tricked into marrying and living with Arab in Gaza, escaped amid escalating abuse. An unusual bar mitzvah ceremony was held on Tuesday for the son of a Jewish woman tricked into marrying and living with an Arab man in Gaza for years. The mother and her children recently managed to escape violent abuse and restart their lives as Jews. "I lived for years as a Muslim. Today I stand as a proud Jewish youth," remarked the bar mitzvah boy, referred to as D., at the event. "I won't forget all the days and nights that I knew I was a Jew but lived as a Muslim in Gaza." The boy lived with his Jewish mother L. and Arab father A. in Gaza with no connection to Judaism until 4 years ago, reports Yisrael Hayom. He comments "I'm realizing a dream thanks to the Yad L'achim organization that brought me to the most moving day in my life." Yad L'achim, an anti-missionary organization that has saved captive Jewish women on numerous occasions, had been helping L. get back on her feet. L. immigrated to Israel from the Muslim country of Uzbekistan at the age of 14, settling in Ofakim between Be'er Sheva and Gaza. At 16 she went to work at a local packing facility to support her family, where she met 17-year-old A. from Gaza, who was working there illegally and hiding his origins. Despite warnings from those around her and her mother's opposition, the girl was tricked into marrying A. a year later, as he bought her gifts and promised her that his family owned land and factories. "He promised me that he loved me and I was happy," recalls L. "What else does a girl need at that age? He sold me tons of lies, and I believed every word of his." While she wanted a Jewish wedding, he convinced her to marry through the auspices of a "lawyer," who turned out to be a Muslim qadi (Sharia judge) who married them in a Sharia Islamic court. In the marriage, L. went through the process of Islamic conversion without knowing it. "I waited for the real marriage, the big fancy party, that he promised his 'rich' family would throw for us," tells L.
A month later she conceived her first son. In the third month of pregnancy, A. revealed to her that he was an Arab from Gaza, that his parents were poor, and that his family of 20 lived in two rooms, sleeping on the floor. Towards the end of the pregnancy A. began threatening, beating, and emotionally abusing his Jewish wife. He was caught by Shin Bet (internal security agency) and deported to Gaza in the 9th month of the pregnancy. From Gaza A. called L. every few hours, telling her to come to him. 40 days after the pregnancy, L. made the fateful decision to travel to Gaza with her newborn infant. "He promised me that I would be a queen in his parents' home," L. relates. "I went into the refugee camp, I was in shock over the neglect and abandonment. Seven brothers and sisters living in a 2 room house." "After a week his mother started abusing me while he was out of the house. He took the [Israeli National Insurance Institute] child stipend and single-parent stipend from me every month, and wasted it on his entertainment," comments L. The couple had two more children over the passing years. As the situation in the house became more violent and dangerous, L. eventually fled and managed to escape Gaza. She and her children have been cared for by Yad L'achim, a group that has returned them to Judaism amid emotional and financial support. When the organization heard that she was having trouble arranging a bar mitzvah for her son, they gathered donations and enabled the event to take place in Be'er Sheva this week. "Now we are Jews," said a visibly moved L. "We have started new lives, and I hope that other women won't fall captive to promises of 'rich men' like I did."